Native Sacramentan Ruth Rippon has long been lauded for her accomplishments in the field of ceramics. As a practicing artist with a prolific career spanning seven decades, Rippon has helped elevate the craft of ceramics into the realm of fine art. Beginning October 29, Exuberant Earth: Ceramics by Ruth Rippon, will be on view at the Crocker, giving visitors the chance to see 90 of Rippon’s works from the 1950s through the 1990s. The exhibition sheds light on her resonating influence on the local Sacramento art scene and the world of ceramics. Thematically driven by her interest in humanity and the natural world, Rippon’s work is often infused with humor and whimsy alongside a technical mastery that speaks to her personality and passion for ceramics. The diversity of style, form, technique, and subject matter in Rippon’s work reflect her insatiable curiosity and appetite for experimentation. Northern California’s longstanding renown as a ceramics center owes much to Rippon, who spent decades working as an artist, teacher, and advocate of fellow ceramists and local artists. She steadfastly exerted her unique talent, generous personality, and vision to shape the recognition and respect now readily accorded the medium. Ruth Rippon (center) teaching majolica techniques to students at Sacramento State, circa 1960. 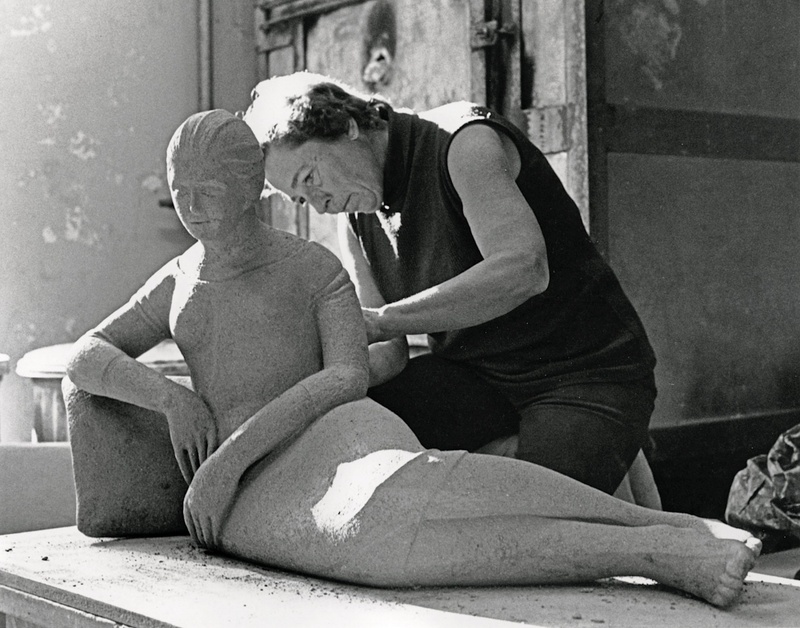 A vanguard on multiple levels, Rippon was the only woman in her department when she was hired at Sacramento State; blazing a trail not only in ceramics, but as a female as well. This exhibition and its catalogue are made possible through generous support from Creative Arts League Sacramento, an organization co-founded by ten women in 1952 to bring outstanding works of local, contemporary artists to the community. Ruth Rippon joined CALS in 1957 and, 60 years later, she is still a prominent member of the organization. Tour the exhibition with Crocker Associate Curator Kristina Gilmore. Designed for art novices and ceramic lovers alike, this intimate walk-through will deepen viewers’ appreciation of Rippon and offer an expanded understanding of California ceramic art. Register here. Inspired by Ruth Rippon’s larger-than-life sculptures of the little old ladies she dubbed “Lollies,” this class will offer students an understanding of the different stages of clay and how to halt the drying process so that works can be sculpted over a period of time. Participants will learn basic hand-building techniques (slab, coil, pinch) to create a table-size sculpture. Students are invited to take their sculptures to Alpha Fired Arts for firing, the final stage of the ceramic process. Educators receive free instruction materials. Register here. View the exhibition and experiment with the versatility of clay. Learn hand-building techniques while you play with air-dry clay and create a tabletop sculpture. Register here. Join an in-depth examination of Rippon's First Ladies Blocks, 1968. Before or after the 30-minute gallery conversation, take time to enjoy lunch at the Crocker Cafe by Supper Club. In honor of the exhibition, hear from ceramics expert and historian Jo Lauria about this important and widely loved art form, and how Rippon's imaginative and groundbreaking work fits into the broader history of ceramics as a modern art form. A curator and lead writer for the catalogue that accompanies the exhibition, Ms. Lauria has a bachelor's in art history from Yale University and an Masters of Fine Arts with a ceramics major from Otis College of Art and Design. Register here. Designed for families with youth ages 7 and older, all participants have an opportunity to learn and grow together as they explore fine and performing art forms. Families will discover the Crocker’s permanent collection of ceramics and explore the process of hand building with air-dry clay. Later, Circa’s acrobats, singers, and musicians will delight everyone with a circus-themed escapade at the Mondavi Center. Transportation is not provided. Register here. Make a clay sculpture inspired by Ruth Rippon. Designed for children ages 7–12 with busy schedules, enroll your child in this session, or several sessions of our winter Material Explosion series. In each session, students will bring an artwork to conclusion, ready to take home. Register here. Cover photo: Ruth Rippon sculpting Camille in the ceramics studio at Sacramento State, 1982.